It's not twangy enough to be country, it's too languid to be called pop -- it's just, well, dreamy. Megan Hickey was a Brooklyn-based bass player trying to start a band when, one day, she picked up a friend's 1940s-era lap steel guitar and found her musical niche -- and what a distinctive niche she's uncovered. 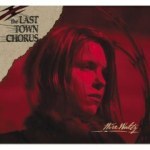 While the Last Town Chorus is the tag for Hickey's rotating collective, the ultimate focus of Wire Waltz is rightfully on her: her enchanting voice and sinuous, self-taught steel guitar. With some basic accompaniment, Hickey creates beautiful, elegant music. The opening and title track introduces the basic motif: that voice and that steel guitar. They fill the speakers -- transformative, fragile, and yet full. A plaintive fiddle sketches the tune and a piano chimes here and there as Hickey's reverbed and multi-tracked vocals draw you in. The same formula follows into the next song, "You", and you might very happily assume that this resonant, mid-tempo technique will carry through the rest of the album. Instead, the songs that follow bring unexpected diversity and experimentation. "Its Not Over" builds to a swirling psychedelic finale, featuring the album's most prominent rhythm section and more than a few overdubs. The push and pull of "Boat" successfully navigates a tricky sonic palette that manages to sound simultaneously dense and minimalist. The wistful "Wintering in Brooklyn" is pleasantly folky and vaguely reminiscent of The Cowboy Junkies. Sprightly "Caroline" is a hidden pop gem whose uncommon steel guitar takes the song out of the mainstream and into the transcendent. Who knew the lap steel could serve songs so well as a lead instrument? "Huntsville 1989" is the album's reigning success. Employing an almost lethargic trip-hop vibe, Hickey's shimmering steel guitar casts a convincing heat over her autobiographical and almost spoken-word lyrics. New-to-town teenagers ("ninth grade refugees") will find tangible truth in couplets like "Alabama '89/ I found the kids with boots like mine" and "goin' to bed each night with a Smiths cassette and diary writing /goin' to school each day with pocket change and an Oscar Wilde book/ waiting for words to save my life". The song is unconventional, uncomplicated, and highly engaging. The album's sole cover is an excellent interpretation, as Bowie's "Modern Love" lyrics echo the same bittersweet and lovelorn themes found within Hickey's originals. She deconstructs the song into a breathy and cinematic meditation, one which caught the ears of Grey's Anatomy producers, who featured it in a recent episode. It's only when Wire Waltz veers too much towards melodrama that it missteps. "Understanding" suffers from a distracting over-use of its title word, while "Foreign Land" aims to parallel the peculiarity of a person and a place, but comes off awkwardly directionless. Wire Waltz ultimately benefits most from its contradictions. Though seemingly dependent upon a simple formula, there's a breadth and depth of texture in these arrangements. Moreover, despite the fact that Hickey employs a "classic country" instrument, she creates a sound that is more urban than rural. It's not twangy enough to be country, it's too languid to be called pop -- it's just, well, dreamy. Hickey recorded Wire Waltz in her home studio, and also takes the producing and engineering credits. She has said that she's found her "own little piece of the sonic universe". It is one that I'm more than happy to inhabit.